Do you have what it takes to survive and make it to the sequel? Chances are, you already know what Ghostface is all about. No matter who is concealing their identity under the classic white mask, they all have one thing in common: murderous urges. If someone you knew had a grudge toward you and they were hiding under the ghostly mask, do you think you could outsmart them and survive. There's actually a very simple formula when it comes to surviving if you're going up against a psycho killer. First things first, you have to stay away from any sort of typical illicit teenage behavior, so you may want to think again before you head over to your friend's raging party. Plus, never seclude yourself from the rest of the group! Being alone can result in...death! Although, if you're taking a look at this costume then you you most likely are interested in being the villain than the sole survivor. If you want to be the villain, then you job is a lot easier. Just throw this costume on, get in touch with your sinister side, then run amok! We have a feeling that you'll love hunting down all of your potential "victims" while wearing this officially licensed Scream movie costume. You'll look exactly like one of Wes Craven's evil creations when you wear this long black robe with draped sleeves and a shredded bottom. 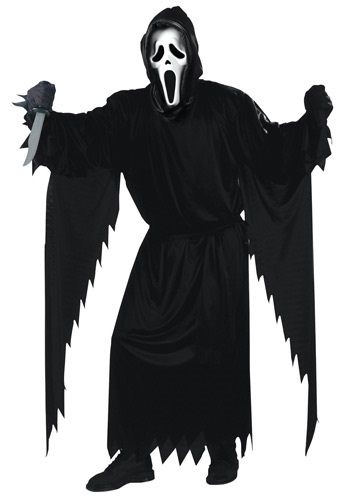 The traditional ghoulish mask is also included with this movie inspired costume. Just grab a fake knife prop and a voice changer and let the chaos begin!